When it comes down to it – all decisions we make are a guess about the future. The harder our world is to predict, the harder it is to make good guesses. 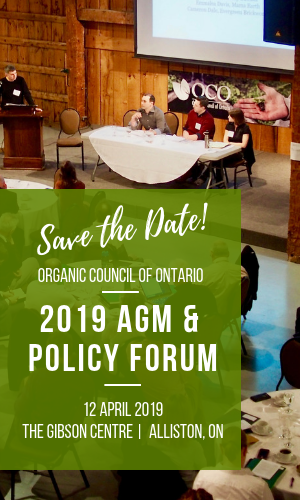 This new series of reports published by the Organic Council of Ontario (OCO) is designed to help us make better guesses about the future of Ontario’s organic system. Ontario makes up an estimated 38% of national organic sales. Working with the Canadian Organic Trade Association, we estimate that the organic market in Ontario has been growing at a rate of 10% in the last 2 years and is worth approximately $1 billion in 2011. In this report we draw on information from a third party survey conducted for OCO by Informa Market Research in 2012 and discuss the opportunities and challenges identified by the diverse stakeholders building this market and how they plan to respond in the next three years. This report highlights provincial information on Ontario organic production using information obtained from certification bodies operating in the province, along with information from the 2010 farm census. This report is based on data from certifying bodies and was written in response to a request in 2011 from the Ontario government for baseline organic data. Canadian Organic Growers and the Organic Council of Ontario collaborated to provide data on a regional basis for the province of Ontario. This report describes the Ontario organic markets that involve direct producer-consumer exchange, including Community Supported Agriculture, Organic vendors at farmers markets and organic on-farm marketing. This report was commissioned by the Ontario Farm Fresh Marketing Association for OCO in 2011. This report takes a look at differences, successes and challenges of certified and non certified organic firms and farms in the province. Ontario’s organic markets in large urban centres are quite different than those in smaller towns and rural areas. In this report we outline some of the differences along the value chain in different parts of the province. Intermediaries or ‘handlers’ have a central role in Ontario’s organic system. Their strategic location in the value chain means they are often the first to identify challenges and opportunities. This report summarizes several case studies and business models of some of these stakeholders. We gratefully acknowledge and appreciate the support for this project provided through the OMAFRA New Directions program.